The word ‘esoteric’, contrary to what you will nowadays find in a dictionary, in its original and true meaning is another word for the inner-most, the place inside every man, woman and child that is ever-present and untarnished by life’s events and all the pressures, constraints and expectations that we have taken on since we were young. Esoteric Healing is a gentle, hands-on technique on the clothed body that rebalances and retunes by supporting us to let go of the burdens we take on in our everyday lives. Letting go of these issues and tensions through Esoteric Healing leaves us in a much more still and harmonious state, allowing supportive choices and decisions to be felt from the physical body and sustained from a place of clarity and innate knowing. Esoteric Healing supports us in returning to a gentler and more loving way of being and living life. 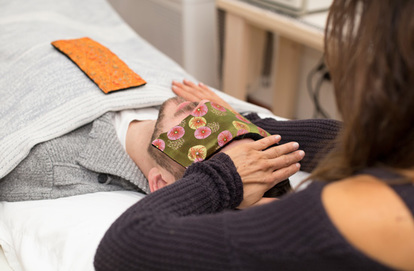 No practitioner or modality can do that for us, but this modality can offer us support by way of a marker – the tangible experience of gentleness in the body - which we can, if we choose to, use as a very real and bodily felt experience of how life and our body can feel, going forward. From here a way of living becomes clearer as each choice made can be felt to support this state of harmony or not. Hence, any changes made are those felt by the individual to be right for them, i.e. healing is always a choice and it is based on honesty and self-responsibility. Esoteric Healing does not offer a superficial cure or quick fix and is never a replacement for conventional medicine.